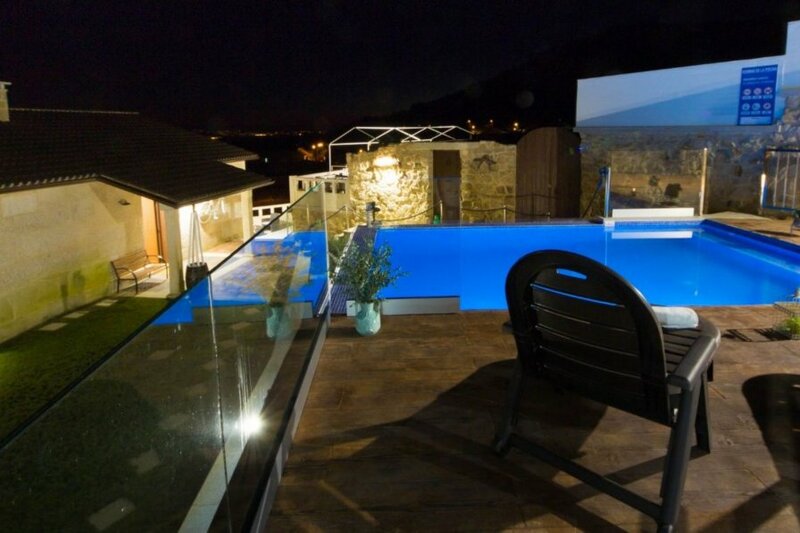 This villa with swimming pool is located in Poio and sleeps 12 people. It has WiFi, barbeque facilities and parking nearby. The villa is walking distance away from fishing spots and swimming spots. The villa in Poio, Pontevedra, has capacity for 12 people and has 5 bedrooms and 5 bathrooms. The accommodation is 360m2, fully equipped and cozy, is located into a well comunicated neighborhood and rural. The accommodation is equipped with kitchen, coffee maker, dish washer, dishes and tableware, kettle - water boiler, microwave, oven, refrigerator, Toaster, pan, iron and ironing board, washing Machine, hairdryer, indoorfireplace, linen - bed sheets, towels, pool, beach walks, car necessary, babies allowed, pets not allowed, deposit to be paid upon arrival time, parties and events are forbidden, barbecue, parking included, shopping, garden furniture, WIFI Internet, activities, bathroom with shower, heating, garden, location type, fishing, sailing, swimming, beach, ocean view, restaurants, family, children welcome and hiking. It is located 5 Km from the Sand Beach Combarro, 1.5 Km from Supermarket, 36 Km from Airport Peinador and 8 Km from Train station Pontevedra. It has Sea views. Extra charges (to be paid on arrival): Security deposit: 300 Euros. Tourist License: VUT-PO-002873.